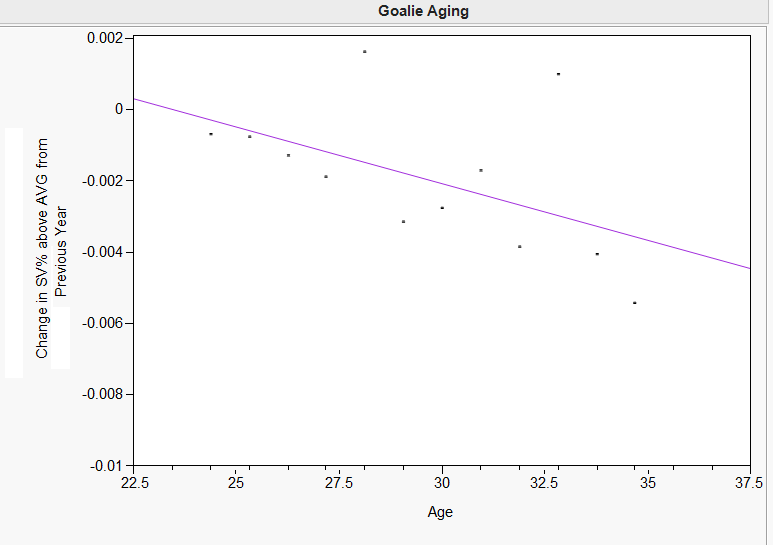 First of all, you’ll note that there’s a clear negative track here as you might expect: goalies get worse as they age, as we’d expect. Second, you’ll notice that, blatant outliers notwithstanding, goalies DO NOT IMPROVE. 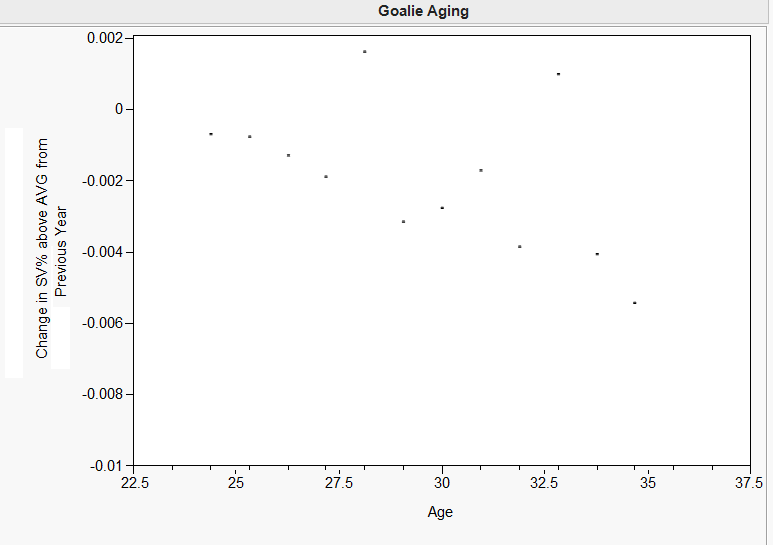 Goalie performance is on average ALWAYS worse relative to average as they get older, even at young ages. 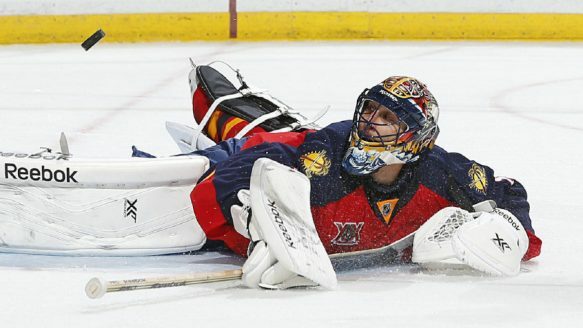 Your lousy 25 year old goalie is not going to get better with experience – he’s just going to get worse. In short, this type of curve extrapolates that a .920 (well above average) goalie at 35 will be at .909 in two years (quite below average) and .885 by age 40! It’s hard to know if this is true since we have so few goalies this old in the data set, but it is hard to believe that physical performance can drop off THAT much in a SINGLE year, even in the mid 30s. 3. 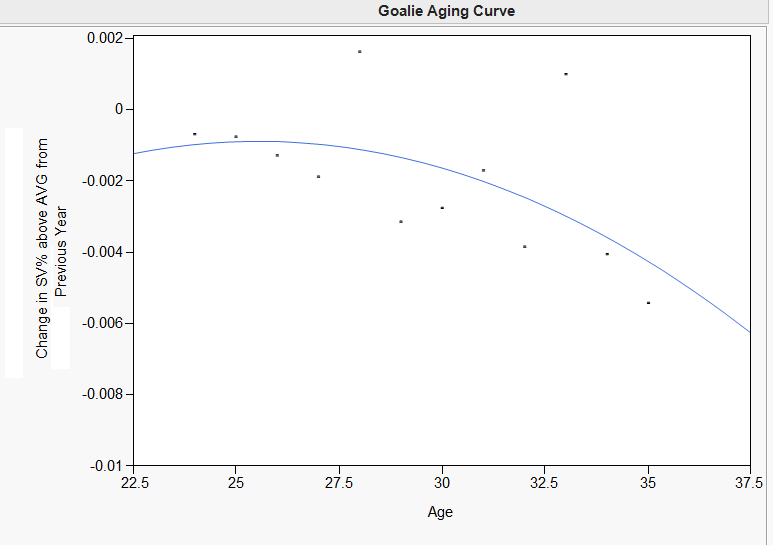 By mid-30s, even with the aging line, goalies rapidly start to fall apart. With a few 27-32 year old goalies hitting free agency this year, teams should REALLY be careful how much and how long they pay guys who are hitting the roughest years in their careers. ← What’s the deal with Andrew MacDonald: Why do the statistics suggest he’s terrible? The sample size was from roughly 40-50 goalies from ages 25-34, and the curve above also uses the 27 goalie sample at age 35 and a 31 goalie sample at age 24. Over 800 seasons and this is how small our samples are of goalies who played consecutive seasons (lockouts didn’t help this study). Based on all the work you’ve done projecting goalie performance who do you think the Islanders should get next season and what save percentage does your model predict for them? I’ll be doing a post on that for LHHockey after the season is over. I’ll also be running updated Marcel projections after the season, now including the aging adjustment. In short, the Isles need two goalies, so it depends on the market. Halak is almost certainly going to have the best projections of any FA goalie. It’s generally best to use the simplest regression possible, so without any a priori reason to use a quadratic form, it’s probably best to use a linear regression. Well, we have a pretty good priori reason – aging curves tend to be curves for the logical reason: people get better, more strong and skilled, up till a point and then decline thereafter, with the decline compounding as you get older. So we should expect a curve unless proven differently. It would seem likely that the low number of opportunities available for goalies should affect the early part of the curve since it is very difficult for a young goalie yo break through to full time starter position, thus distorting the data (only the most promising goalies are represented from that age group, “easier” to maintain high average numbers over less games played by backup. The method used here should avoid selection bias since it tracks average change in individual goalie performance, not the average change in the group. It seems very odd to think there is no benefit to NHL experience at goaltending, unlike forward or defence.